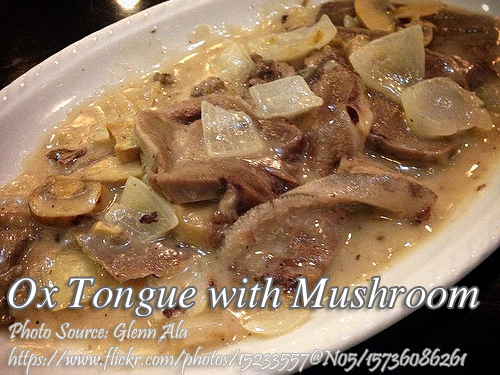 This is a simple lengua or ox tongue recipe that requires simple and few ingredients. The process of cooking this dish is cooking the ox tongue first by boiling it in spices, seasonings and liquor(Gin). Then making the creamy sauce with flour, butter, cream, mushroom and wine (sherry and brandy). The wine is best for removing the gamy flavor of meat and this is the reason why it is included in this dish. You will be delighted with the taste of this dish with it’s creamy mushroom sauce. To cook the tongue; Clean the tongue by blanching about 5 minutes. Remove coarse outer layer. Fry the tongue to seal the meat. In a large pan, cook the tongue with the peppercorns, bay leaf, salt, vinegar, gin and onion. Bring to a boil then simmer covered. As the liquid reduces, add water until the tongue is cooked. Remove the tongue and strain the remaining stock back into the pan. Reserve the stock. Slice the tongue diagonally into 1/4-inch portions and set aside. To cook ox tongue with mushrooms; Make a blond roux lay lightly toasting flour in a saucepan until flour is creamy in color. Add butter and cook into a fine paste. Add stock, wine and mushrooms. Simmer until thick. Add cream, if desired. Season with salt and pepper to taste. Add sliced tongue and garnish with olives. Clean the tongue by blanching about 5 minutes. Remove coarse outer layer. Fry the tongue to seal the meat. In a large pan, cook the tongue with the peppercorns, bay leaf, salt, vinegar, gin and onion. Bring to a boil then simmer covered. As the liquid reduces, add water until the tongue is cooked. Remove the tongue and strain the remaining stock back into the pan. Reserve the stock. Slice the tongue diagonally into ¼-inch portions and set aside. Make a blond roux lay lightly toasting flour in a saucepan until flour is creamy in color. Add butter and cook into a fine paste. Add stock, wine and mushrooms. Simmer until thick. Add cream, if desired. Season with salt and pepper to taste. Add sliced tongue and garnish with olives. Hi Villy, thanks also for the kind words! Cheers!